Unsightly black stains or streaks on asphalt shingles are caused by a hardy type of algae called Gloeocapsa Magma. The algae feeds on the crushed limestone that is used in asphalt shingles. Rain spreads the algae down the roof causing the black streaks. These streaks are not only unsightly but cause the shingles to fail prematurely by not allowing the shingles to reflect heat properly. This is not because of their functionality. 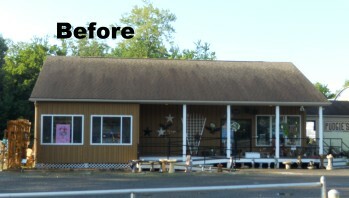 Half of the roofs ever replaced in the Midwest didn’t need replaced, only a simple roof cleaning. Just as mold and mildew can grow on your vinyl siding, wind blown algae can land and grow on your roof. Replacing your roof because of this algae is like replacing your siding instead of having it cleaned; it just doesn’t make sense.